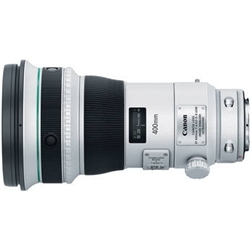 Featuring a unique optical design and paired with advanced image stabilization technologies, the Canon EF 400mm f/4 DO IS II USM Lens is a super telephoto lens designed for full-frame EOS DSLRs. Gapless dual-layer diffractive optics are employed within this lens' construction to produce a smaller, lighter weight 400mm option with enhanced correction for chromatic and spherical aberrations. Aspherical and UD elements are also utilized to further reduce distortions and optimized coatings contribute to increased clarity and contrast. Complementing the sophisticated optical layout, a four stop-effective Optical Image Stabilizer helps to minimize the appearance of camera shake and can be dedicated to different styles of shooting. 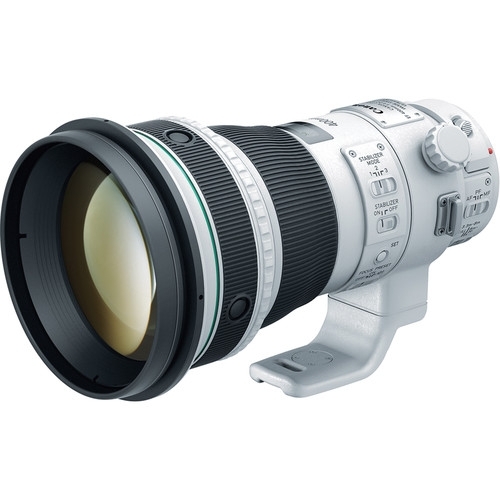 Ideally positioned as a versatile option for sports and wildlife photographers, this lens' high-performance attributes and natural handling render this a viable telephoto option for a variety of applications. Housed within a weather-resistant barrel, this lens also features fluorine coatings on the front and rear elements for protection against fingerprints and other elements from affecting image quality. Focusing handling is complemented by the inclusion of AF stop buttons at the front of the lens, as well as full-time manual focus override and Power Focus mode for smooth shifting of focus. Super telephoto 400mm f/4 lens is compatible with full-frame EOS DSLR cameras, as well as APS-C-sized sensors where it will provide a 35mm-equivalent focal length of 640mm. Gapless dual-layer diffractive optics contribute to a marked reduction in chromatic and spherical aberrations as well as benefit the design of a relatively compact and lightweight lens. One large diameter ground aspherical element and one Ultra Low Dispersion (UD) element minimize aberrations and distortions while also contributing to greater sharpness and clarity. An Optical Image Stabilizer helps to minimize the appearance of camera shake by up to four shutter speed stops to better enable working in low-light conditions and with slower shutter speeds. Additionally, three dedicated image stabilization modes are available-Standard, Panning, and During Exposure Only-and can be selectively employed to suit a variety of types of shooting. Furthermore, the image stabilization system does not need to be disabled when shooting with a tripod. An Ultrasonic Motor (USM), along with an internal focusing system, is employed to deliver fast, precise, and near-silent autofocus performance. Located at the front of the lens, AF stop buttons allow you to intuitively stop the lens from autofocusing at any time. A dedicated Power Focus mode produces a smooth, measured focusing movement that is well-suited to video applications.